Rita Marie Winters came into the world in Claxton (or Dayton? or Daisy? ), Georgia back in 1932. Country music fans came to know her has Rita Robbins. Her first stage appearance was at the age of six at a school play. She began her musical journey singing with her family at various U. S. Army camps around Savannah, Georgia during World War II. As a youngster, she would often enter local talent contests. But one in particular probably stands out in her memories. During one contest, for selling U. S. Bonds, her talents helped sell $50,000 worth of bonds. When she graduated from high school, she became an airline stewardess with Peninsula Air Transport. Her work would take her to such cities as Chicago, Detroit, New York, Dallas and Tulsa. Her family had moved to Miami, Florida around 1949 or so. This may be where that airline was based. Her first television appearance was over a station in Miami. Her father was a disc jockey and band leader by the name of George Winters. According to one article, he encouraged her musical career and helped her develop an "...unusual and infectious style of delivery." At one point she teamed up with Anita Carter and Ruby Wells on a few recordings. She also recorded a tune with her brother, Don Winters. It should be noted that Rita did not really start to think about a career as a performer until her brother Don did an audition tape for Cameo Records back in 1953. Somebody liked what they heard of her on that recording session and signed Rita to the Cameo label. Her first release for Cameo was said to be "Take A Look At That Moon." Pee Wee King reported in his column in 1955 that Rita had appeared on his television show. Country & Western Jamboree spoke favorably of her release on RCA that included the tunes "Don't Take All The Love" b/w "Go Between" and thought it was a toss-up as to which side was the "A" side. 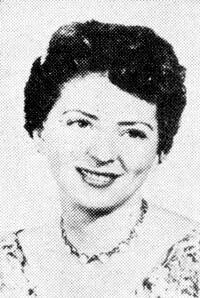 In 1955, Country & Western Jamboree's Disc Jockey poll ranked her Number 4 among "Top New Female Singers" behind Myrna Lorrie, Ginny Wright and Betty Amos. The next year, she was named one of the "Top Female Singers". Her career appears to have been short-lived as we have found no mention of her after 1958. 20-6083 A How Long Do You Cry? 20-6612 B Why Don't You Be Good?